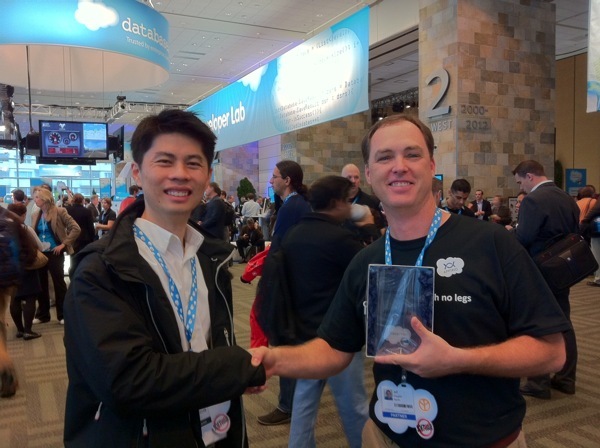 Many thanks to salesfore.com for the "Developer Hero" Award at this year's Dreamforce! The awards were given during the Platform State of the Union session (14 minutes into the video) by Nick Tran and Richard Vanhook and Mike Leach were recipients as well for their hard work in the community. It's such a great community and I'm very grateful for the recognition. Just accepted "Developer Hero" award on behalf of Jeff Douglas at the Platform State of the Union! I got a chance to meetup with Nick after the session and thank him for the award and the nice words he said about me during the ceremony. Photo courtesy of Jon Mountjoy.